From plants and animals to stars and galaxies, all material is made up of matter. But what is matter, exactly? 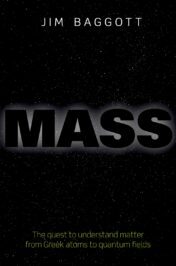 In the following shortened excerpt from Mass, Jim Baggott explains the history behind our modern understanding of matter and speculates on the potential discoveries of the future. We learn in school science class that matter is not continuous, but discrete. As a few of the philosophers of ancient Greece once speculated nearly two-and-a-half thousand years ago, matter comes in “lumps.” If we dig around online we learn that we make paper by pressing together moist fibers derived from pulp. The pulp has an internal structure built from molecules (such as cellulose), and molecules are in turn constructed from atoms (carbon, oxygen, hydrogen). We further learn that atoms are mostly empty space, with a small, central nucleus of protons and neutrons orbited by electrons. You might have also learned that protons and neutrons are not the last word on this subject. Particles thought to be the ultimate building blocks of matter or (more likely) whose internal structures are presently simply unknown are referred to by scientists as “elementary.” According to this definition protons and neutrons are not elementary particles. They are composites, assembled from different kinds of quark, held together by gluons. Okay, so things are a little more complicated than we might have supposed. But surely all we’re really seeing here is successive generations of scientific discovery peeling away the layers of material substance. Paper, card, plastic; molecules; atoms; protons and neutrons; quarks and electrons. As we descend through each layer of matter we find smaller and smaller constituents. This is surely hardly surprising. 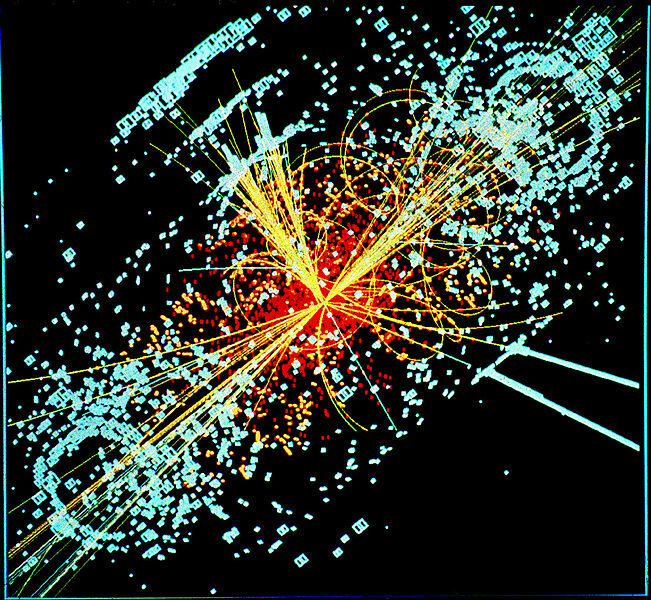 A computer-generated image of a Higgs interaction. Following a collision of two protons, a Higgs boson is produced which decays into two jets of hadrons and two electrons. The lines represent the possible paths of particles produced by the proton-proton collision in the detector while the energy these particles deposit is shown in blue. Credit: “CMS Higgs-event” produced by The European Organization for Nuclear Research. CC BY-SA 3.0 via Wikimedia Commons. But then, just as surely, we can’t keep doing this indefinitely. Just as the ancient Greek philosophers once speculated, we imagine that we should eventually run up against some kind of ultimately fundamental, indivisible type of stuff, the building blocks from which everything in the universe is made. What we have discovered is that the foundations of our universe are not as solid or as certain and dependable as we might have once imagined. They are instead built from ghosts and phantoms, of a peculiar quantum kind. And, at some point on this exciting journey of discovery, we lost our grip on the reassuringly familiar concept of mass, the ubiquitous m that appears in all the equations of physics, chemistry, and biology. To the ancient Greek atomists, atoms had to possess weight. To Isaac Newton, mass was simply quantitas materiae, the amount or quantity of matter an object contains. On the surface, there seem no grounds for arguing with these perfectly logical conclusions. Mass is surely an “everyday” property, and hardly mysterious. When we stand on the bathroom scales in the morning, or lift heavy weights in the gym, or stumble against an immovable object, we pay our respects to Newton’s classical conception of mass. But when a single electron passes like a phantom at once through two closely spaced holes or slits, to be recorded as a single spot on a far detector, what happens to the mass of this supposedly ‘indivisible’ elementary particle in between? Einstein’s most celebrated equation, E = MC², is utterly familiar, but what does it really mean for mass and energy to be equivalent and interchangeable? The so-called “standard model” of particle physics is the most successful theoretical description of elementary particles and forces ever devised. In this model, particles are replaced by quantum fields. Now, how can a quantum field that is distributed through space and time have mass, and what is a quantum field anyway? What does it really mean to say that elementary particles gain their mass through interactions with the recently discovered Higgs field? If we add up the masses of the three quarks that are believed to form a proton, we get only one per cent of the proton mass. So, where’s the rest of it? And then we learn from the standard model of inflationary big bang cosmology that this stuff that we tend to get rather obsessed about—so-called “baryonic” matter formed from protons and neutrons—accounts for less than five per cent of the total mass energy of the universe. About twenty-six per cent is dark matter, a ubiquitous but completely invisible and unknown form of matter that is responsible for shaping the large-scale structure of visible galaxies, galaxy clusters, and the voids in between. The rest (a mere sixty-nine per cent) is believed to be dark energy, the energy of “empty” space, responsible for accelerating the expansion of space time. How did this happen? How did the answers to our oh-so-simple questions become so complicated and so difficult to comprehend? Although it’s very unlikely that the way we interpret the nature of matter and the property of mass will get any easier to comprehend anytime soon, we can be reasonably assured that we don’t yet have the whole story. The standard model of particle physics is an extraordinary achievement, but it is also riddled with explanatory holes. There’s an awful lot it can’t tell us about how the physical world is put together. Physicists at the end of the nineteenth century famously thought they’d got it all figured out. Now we know better. We’ve since learned an awful lot, but we’re also very aware of what we don’t know and can’t explain. If we dream of a destination where we have ultimate knowledge of everything, then I doubt we’ll ever get there. But I’m also convinced there’ll be much to see—and much still to learn and enjoy—as we make the journey. Featured image credit: “Andromeda Galaxy” by Adam Evans. CC BY 2.0 via Wikimedia Commons. Jim Baggott is a freelance science writer. He was a lecturer in chemistry at the University of Reading but left to work with Shell International Petroleum Company and then as an independent business consultant and trainer. His many books include Origins: The Scientific Story of Creation, Higgs: The Invention and Discovery of the 'God Particle', A Quantum Story: A History in 40 Moments and A Beginner's Guide to Reality, and Mass: The quest to understand matter from Greek atoms to quantum fields. Dark Energy? Might as well be the Flying Spaghetti monster!